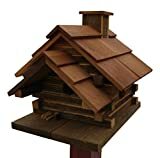 Give your favorite backyard feathered friend's nest an upgrade with this cool new Conestoga Log Cabin Birdhouse. This rustic log cabin for birds is handcrafted in Pennsylvania Dutch country from naturally weather- and insect-resistant reclaimed cedar. It features built-in ventilation, a 1.75" diameter entry hole, and a removable back wall for cleaning. It's sure to make the rest of the neighborhood birds jealous.